Don’t miss the event of the season – the Holiday Shops Grand Opening Party! 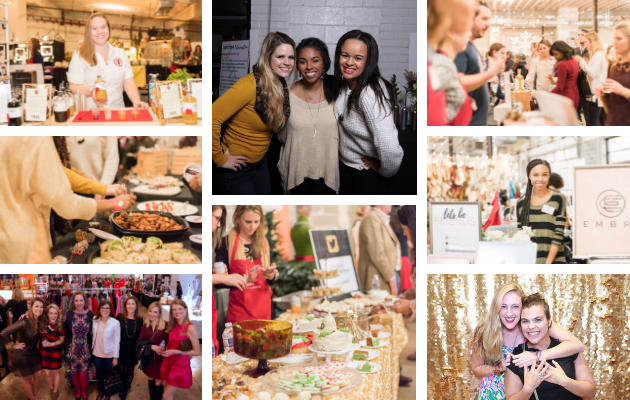 Shop the market ahead of the crowds, sip and taste the best of DC, and enjoy a fabulous silent auction, all the while supporting the mission of the Junior League of Washington. We are celebrating Holiday Shops 60th year and highlighting the positive impact of JLW on the DC community. Food & Cocktails Enjoy unlimited tastings of food from the best DC restaurants and an open bar featuring craft breweries and local distilleries. After you’ve shopped ’til you’ve dropped, enjoy bites from Chef David Gaus from Bayou Bakery, Coffee Bar & Eatery, Rasa, Del Frisco’s Double Eagle Steakhouse, BlackFinn, Roti, and Sloppy Mama’s BBQ! Our famous six-foot long cheese table returns, with artisanal crackers from Firehook Bakery. Our well stocked bars feature two specialty cocktails for the evening: the “Merry Mule” featuring ginger syrup from merchant Pratt Standard Cocktail Co. and a “Pineapple Allspice Punch” with pineapple allspice shrub from merchant Shrub District. End your evening with a sweet bite to send you on your way. Treats from Buttercream Bakery, District Desserts, and Corner Bakery Cafe will be there to tempt your sweet tooth. And merchants The Dough Jar, Capitol Candy Jar, and MFG Toffee also offer up sweet treats for you to try – and then buy! Silent Auction Check out all of our exciting silent auction items by clicking here and bid from noon to 10 p.m. on Friday, November 16, 2018, anywhere using the Handbid app! Bidders are notified via text or push notification when they are outbid, so you do not have to stop shopping and mingling to rebid on your must-have auction items. Can’t make it to the Holiday Shops Grand Opening? You can bid from home on Handbid! Download the app today; available for Apple and Android devices. Restaurant Tree Donate $15 or $25 for an instant win of a gift card to a local restaurant. Raffle Buy a $10 raffle ticket for the chance to win 14k convertible diamond drop earrings from Alexandria & Company or $1,000 VISA gift card. Drawing will be held on Sunday, November 18th at 2 p.m. Your presence is not required to win and winner will be notified by phone and email. Merchant Shopping Get an early start on holiday shopping from 6 – 11 p.m. with our 70+ merchants. We have something for everyone including unique drawings of DC monuments, women’s clothing, men’s accessories, and children’s toys. You can also purchase a book to donate to a child in need. 15 percent of all sales go to drive the mission of JLW of developing women leaders and improving the DC community. For a list of confirmed merchants, click here.